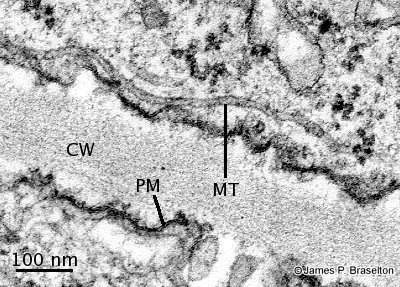 Transmission electron micrograph of thin section of wheat root showing microtubules (MT), plasma membrane (PM), and cell wall (CW). Reference: Braselton, J. P. and M. D. Bennett. 1980. Purification of lumicolchicine for use in studies of plant development. Protoplasma 103: 105-114. Simple Diagram of Cell Membrane- Michael W. Davidson. (2004). Plasma Membrane. Available: http://micro.magnet.fsu.edu/. Last accessed 10 March 2012. All living cells possess a plasma membrane that surrounds the contents inside them. The plasma membrane is a semi-permeable membrane(selective entry) consisting of phospholipid bilayer; with hydrophilic heads and lipophilic/hydrophibic tails; and embedded proteins. 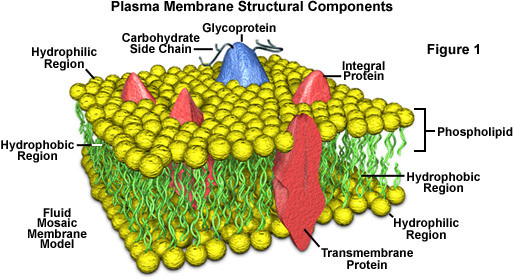 The fluid mosaic model is the most updated model showing us the formation of the plasma membrane and it various components. The Plasma Membrane is what controls the movement of substances in and out of a cell. It is also responsible for cell recognition, cell communication, packaging and secretion, protein synthesis, energy transfer and adhesion. 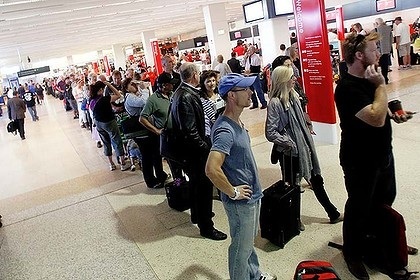 Just as a Plama Membrane can be decribed as being semi-permiable or only letting certain substances into the cell, customs and Immigration Clearance can be seen as the plama membrane of an airport. If you do not fit the needs of the plama membrane; providing your passport and having the right items in your possesion; you will obviously be rejected from entering the airport through the plasma membrane. However even if you do have illegal, unwanted substances such as cocain with you, but the substance is so small and hard to be see then it may pass the membrane and cause damage on the other side just as a substance such as CHCl3 (chloroform) would do in a cell.